Syrian Arab News Agency: Eighteen citizens, among them children, were martyred while tens others were wounded as a car bomb was exploded today at the crowded intersection of Khodr Street and al-Suyouf Square in Jaramana, Damascus Countryside. 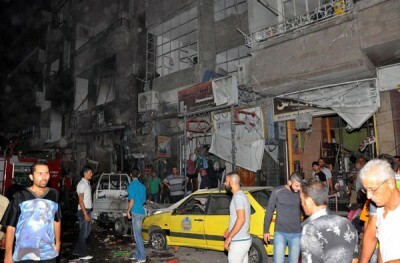 “Terrorists blew up a car bomb with big quantities of explosives in the area which is crowded with inhabitants, claiming the lives of 18 citizens, among them 3 children and injuring 56 others,” A source at Damascus Countryside Police command told SANA. It added that the wounded citizens were admitted to the hospitals to receive treatment, some of them in critical conditions. SANA reporter said that the explosion caused fires to a building of four floors and material damages to the near shops and cars. Religious Freedom Coalition Chairman William J. Murray appeared on the Mike Huckabee show earlier this week to discuss the ongoing murder of Christian civilians in Jaramna, Syria. Please listen to his interview.